I made homemade peanut butter today. What did you do today, Felix Baumgartner? No. I didn’t ask about yesterday, I asked about today. I WIN. YOU LOSE. I took today and tomorrow off, so I’ve been cleaning, making bacon, egg and gouda sandwiches (…you fancy, huh?) and watching Doctor Who on DVD. I also have a fake food project I’m working towards. Someone asked me to make peanut butter cookies, so make them I shall. Peanut butter cookies aren’t my favorite, but I found a recipe that my Gramma gave me. So, it’s on. And why not make the peanut butter cookie process a lot more difficult and time consuming by making the peanut butter yourself! Like a dbag! Honestly? I decided to make this homemade peanut butter so I could justify buying myself a full-size food processor. I’ve had a mini one up until now, but unless you’re making a tiny marinade for like…one chicken wing, it’s not really that useful of a tool. So, I found a recipe for Alton Brown’s homemade peanut butter on foodnetwork.com. And this is where the trouble started. First thing, I could NOT find peanuts in their shells anywhere. George Washington Carver, the inventor of the peanut, wept in his grave. (I also could not find a joke that works…but whatever.) Went to Whole Foods. Went to Fresh Market. Found other nuts in their shells, but no peanuts. I settled on unsalted, blanched peanuts, because they already had their skins removed. But I tasted them and they taste like unsalted, blanched cardboard. I had to fix this or I would have spent $12 on peanuts that I would have brought home from the store and then more than likely thrown in the garbage. I decided to roast the peanuts at 375 for about 15 minutes with a generous sprinkling of salt, which kind of does the trick. Anyways. Now, here’s the rest of the recipe, minus the roasting fiasco. 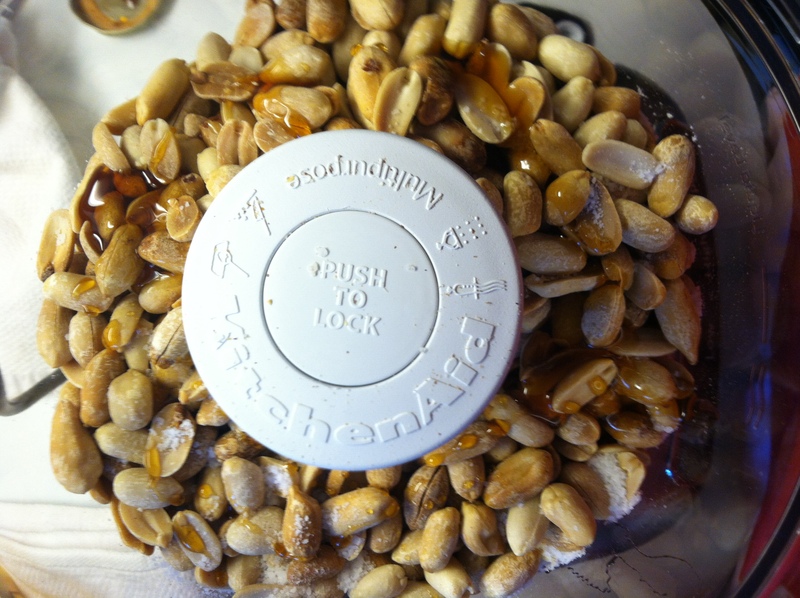 Combine peanuts, salt and honey in your food processor and process for one minute. And process for one minute. …And process for one minute. ….Why won’t this damn thing turn on. …No… No, I did not. 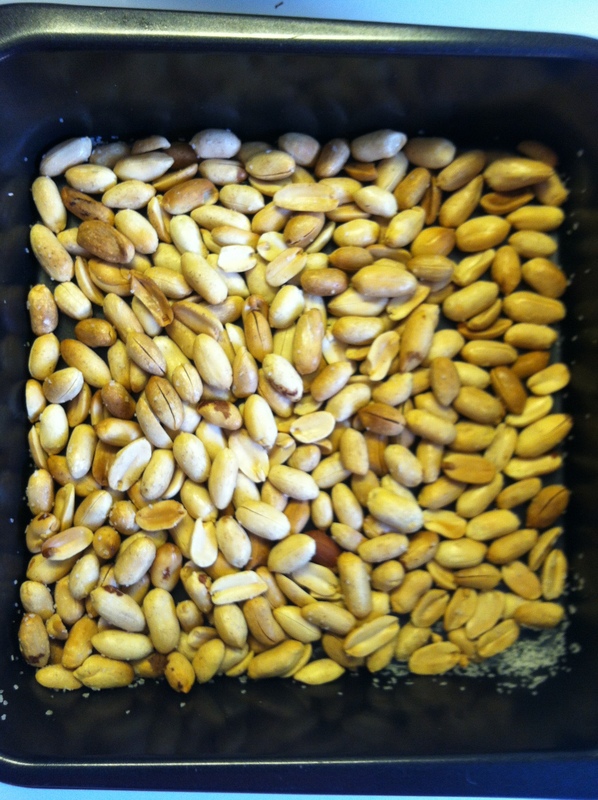 After my large slice of humble pie, I roasted a new set of peanuts and processed. The results are tasty, but not the most spreadable. In his recipe, Alton Brown notes that for making peanut butter, one should use Spanish peanuts because they have a higher oil content. 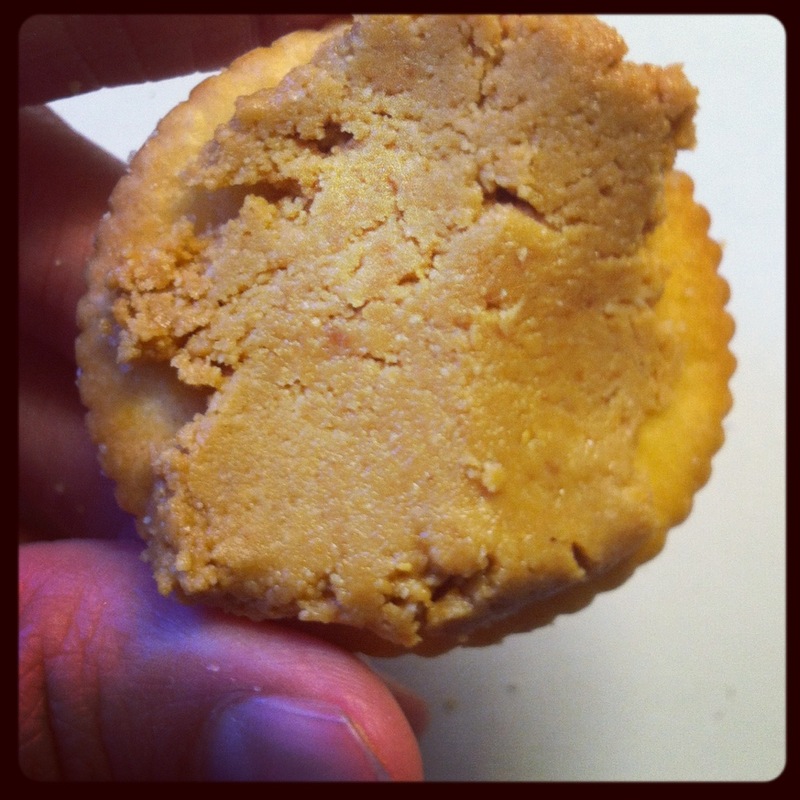 I don’t think I had Spanish peanuts because the texture of this peanut butter isn’t quite right. Jif would definitely win a beauty pageant and this peanut butter would get Miss Congeniality. (She sure is trying hard!) But there’s a really good roasted flavor with a background of saltiness. And it’s not overly sweet, which I think is nice. Not sure if I’ll bake the cookies with it yet. Maybe I’ll make one batch with it and one batch with the Jif, just to see how it turns out. Felix Baumgartner makes history. I make peanut butter. He may have the upper hand, but mine tastes better. I’ll bring you some, if I don’t use it all baking! This is my favorite thing on the Internet today and that says a lot because I sure watched a lot of cat videos on YouTube today. my fake food blog: the internet’s number one home for obscure “callback machine” references. A reference only you, Jack McBrayer and Jon Hamm would get. And only you would remember.